Download "MIT LINCOLN LABORATORY REPRESENTATIONS AND CERTIFICATIONS-COMMERCIAL (JUNE 2014)"
1 The MIT Lincoln Laboratory preferred method of verifying annual representations and certifications is through an on-line U.S. government website, which is available at We request that as a MIT Lincoln Laboratory vendor, you complete the Representations and Certifications at If you require an assistance during the process, please call the MIT Lincoln Laboratory Small Business Office at (781) or at If you are unable to use please complete the attached paper representations and certifications and return them with your proposal. INSTRUCTIONS All applicable sections must be fully completed. If quoted amount exceeds $10,000, Offeror shall complete representations and certifications set forth under Part A. Dun and Bradstreet Number (DUNS Number) and SAM Certifications. a. If the bidder has an existing DUNS number and has completed certifications in SAM, please provided DUNS Number here;. b. 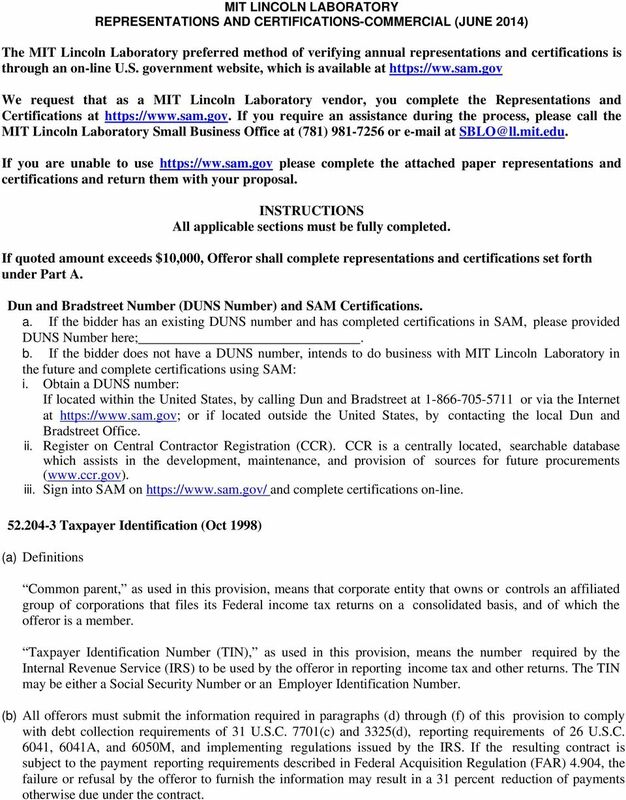 If the bidder does not have a DUNS number, intends to do business with MIT Lincoln Laboratory in the future and complete certifications using SAM: i. Obtain a DUNS number: If located within the United States, by calling Dun and Bradstreet at or via the Internet at or if located outside the United States, by contacting the local Dun and Bradstreet Office. ii. Register on Central Contractor Registration (CCR). CCR is a centrally located, searchable database which assists in the development, maintenance, and provision of sources for future procurements ( iii. Sign into SAM on and complete certifications on-line Taxpayer Identification (Oct 1998) (a) Definitions Common parent, as used in this provision, means that corporate entity that owns or controls an affiliated group of corporations that files its Federal income tax returns on a consolidated basis, and of which the offeror is a member. Taxpayer Identification Number (TIN), as used in this provision, means the number required by the Internal Revenue Service (IRS) to be used by the offeror in reporting income tax and other returns. The TIN may be either a Social Security Number or an Employer Identification Number. (b) All offerors must submit the information required in paragraphs (d) through (f) of this provision to comply with debt collection requirements of 31 U.S.C. 7701(c) and 3325(d), reporting requirements of 26 U.S.C. 6041, 6041A, and 6050M, and implementing regulations issued by the IRS. If the resulting contract is subject to the payment reporting requirements described in Federal Acquisition Regulation (FAR) 4.904, the failure or refusal by the offeror to furnish the information may result in a 31 percent reduction of payments otherwise due under the contract. 2 (c) The TIN may be used by the Government to collect and report on any delinquent amounts arising out of the offeror s relationship with the Government (31 U.S.C. 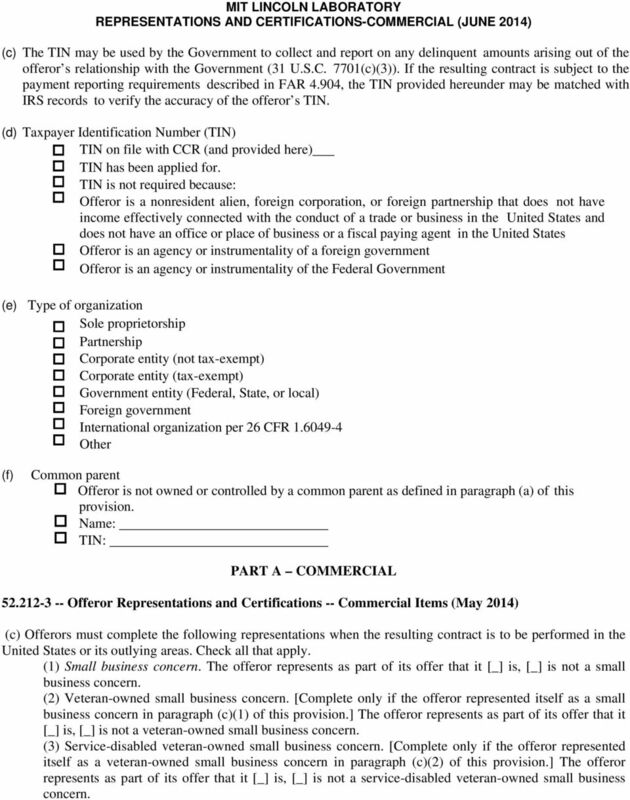 7701(c)(3)). If the resulting contract is subject to the payment reporting requirements described in FAR 4.904, the TIN provided hereunder may be matched with IRS records to verify the accuracy of the offeror s TIN. (d) Taxpayer Identification Number (TIN) TIN on file with CCR (and provided here) TIN has been applied for. TIN is not required because: Offeror is a nonresident alien, foreign corporation, or foreign partnership that does not have income effectively connected with the conduct of a trade or business in the United States and does not have an office or place of business or a fiscal paying agent in the United States Offeror is an agency or instrumentality of a foreign government Offeror is an agency or instrumentality of the Federal Government (e) Type of organization Sole proprietorship Partnership Corporate entity (not tax-exempt) Corporate entity (tax-exempt) Government entity (Federal, State, or local) Foreign government International organization per 26 CFR Other (f) Common parent Offeror is not owned or controlled by a common parent as defined in paragraph (a) of this provision. Name: TIN: PART A COMMERCIAL Offeror Representations and Certifications -- Commercial Items (May 2014) (c) Offerors must complete the following representations when the resulting contract is to be performed in the United States or its outlying areas. Check all that apply. (1) Small business concern. The offeror represents as part of its offer that it [_] is, [_] is not a small business concern. (2) Veteran-owned small business concern. 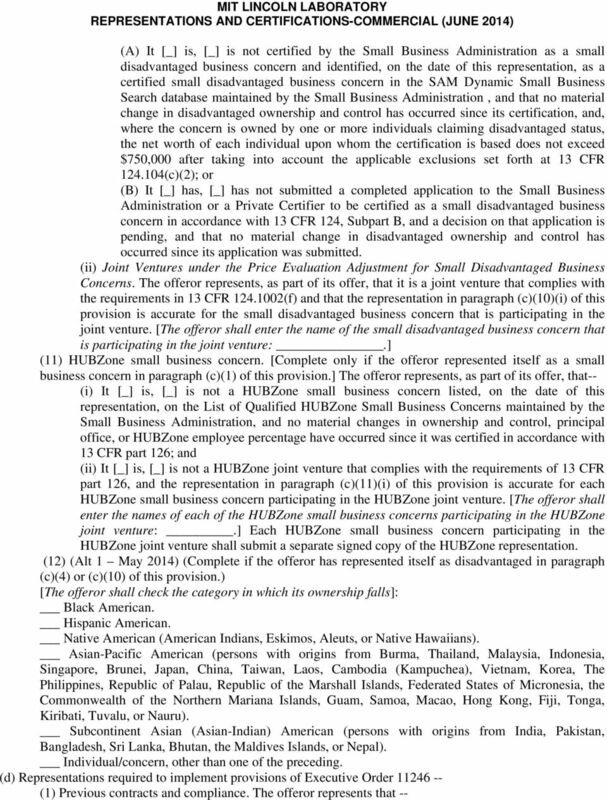 [Complete only if the offeror represented itself as a small business concern in paragraph (c)(1) of this provision.] The offeror represents as part of its offer that it [_] is, [_] is not a veteran-owned small business concern. (3) Service-disabled veteran-owned small business concern. 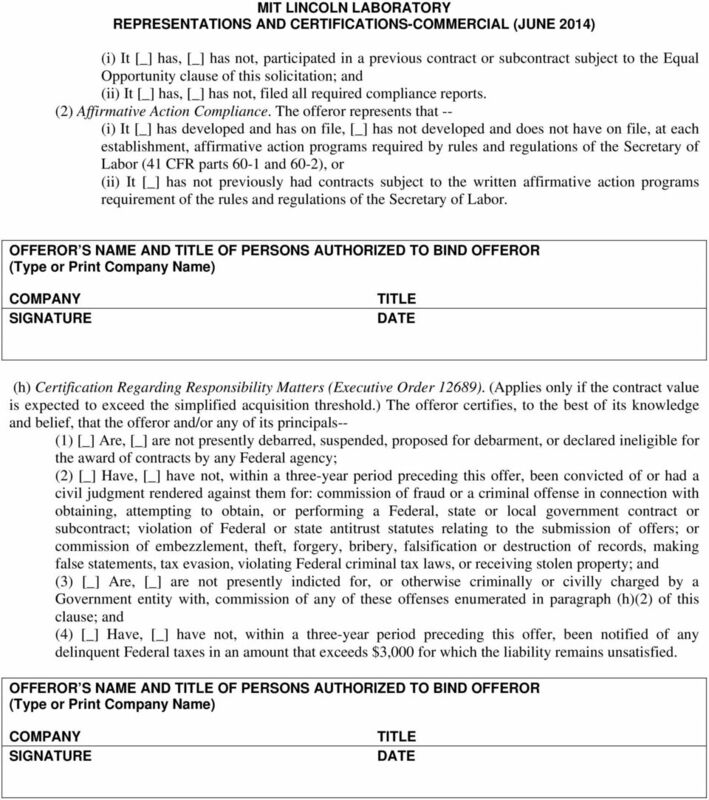 [Complete only if the offeror represented itself as a veteran-owned small business concern in paragraph (c)(2) of this provision.] The offeror represents as part of its offer that it [_] is, [_] is not a service-disabled veteran-owned small business concern. REQUEST FOR QUOTATION PAGE OF PAGES THIS RFQ X IS IS NOT A SMALL BUSINESS SET ASIDE (THIS IS NOT AN ORDER) 1 29 1. REQUEST NO. 2. DATE ISSUED 3. REQUISITION/PURCHASE REQUEST NO. 4. CERT. FOR NAT. DEF. Event Details. Please note that Specifications for Genetec Software Support can be located in the Bid Documents attachment. Grant Writing Services. Request for Proposal Submission Deadline: August 22, 2014 at 12:00pm P.D.T. 8(A) PROGRAM An SBA (Small Business Administration) business development program created to help small disadvantaged businesses compete in the American economy and access the federal procurement market. November 2, 2015 Ms. Colette Pollard Reports Management Officer, QDAM Department of Housing and Urban Development 451 7 th Street SW, Room 4176 Washington, D.C. 20410 RE: Docket No. FR-5835-N-12 Dear Ms. NOTE: Technical proposals shall not include prices or pricing information. SUBCONTRACTING IN GOVERNMENT MARKETPLACES Kathy C. Potter, Esq. Shareholder Benton Potter & Murdock, P.C. (703) 637-0050 kcp@bpmlawyers.com Sharon A. Roach, Esq. Of Counsel Benton Potter & Murdock, P.C. BID FORMS & OTHER SUBMITTALS For. PROVIDE and INSTALL CARPET, SHEET VINYL, and VTC FLOORING for PUBLIC & SPECIALTY HOUSING ITB #2016.